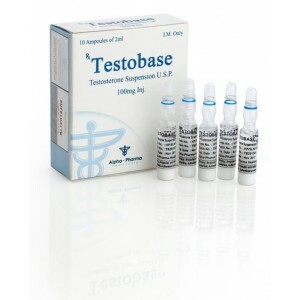 Testosterone suspension (Testobase) is an aqueous solution of non-esterified (without an ester residue, unlike other forms used) testosterone, which is characterized by a rapid onset of action and a high frequency of side effects, in particular, painful injections. Many preparations contain oil or propylene glycol as a solution. It is used mainly only before the competition, because it is not detected after 1 day. Testosterone suspension is the world’s first anabolic steroid, invented in the 1930s. The formula does not include ether, therefore, 100 mg of the active substance are 100 mg of “pure” testosterone. For comparison, 100 mg of testosterone enanthate gives the body only 72 mg of “pure” testosterone, the rest is ether. In general, the effects of the suspension coincide with those of other forms of testosterone. The fastest anabolic effect is felt on the very next day of the course. It is believed that the maximum growth is observed in the muscles in which the solution is found, therefore, it is often used for target muscles. However, this opinion is erroneous (otherwise, there would be asymmetric or local hypertrophy, which looked as repulsive as when using synthol). In general, the aqueous suspension of testosterone is similar in pharmacological properties with propionate. The pharmacokinetic feature of the drug (a rapid increase in blood concentration) provides not only pronounced positive effects, but also serious side effects. The suspension of testosterone is characterized by high androgenic activity, often causing acne, fluid accumulation and gynecomastia. For this reason, PCT is mandatory (antiestrogens are taken from the first day of the course). It has a toxic effect on the liver only in very large doses. Painful injections (although to a lesser extent than propionate and Winstrol).